November 5 might be one of Homer Simpson's favorite days of the year because the National Doughnut Day is celebrated on this date. 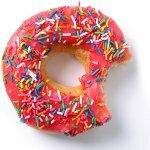 It is one of the two National Doughnut Days (the other is observed in June), so it is sometimes referred to as the National Doughnut Appreciation Day. Doughnuts (also spelled “donuts”) are a type of fried dough confectionery popular in many countries. Doughnuts are usually made from a flour dough and deep-fried. They are typically round or ring-shaped. Doughnuts can be topped with sugar, chocolate, or glazing. They are sometimes filled with cream, fruit preserves, or custard. The history of doughnuts is disputed as there are regional variants of this confectionery in many countries. Some think that American doughnuts were invented by Dutch settlers in the 19th century. Hanson Gregory, an American, claimed to have invented ring-shaped doughnuts in the mid 19th century. But however that may be, by the mid-19th century doughnuts were considered a typically American food. To celebrate the National Doughnut Appreciation Day, pick some doughnuts at your favorite local bakery and indulge yourself with this delicious dessert. Just don't go overboard as doughnuts contain much fat and thus cannot be considered a healthy food.